Bangor Grammarians are proud to lend their support to next week’s fundraiser, involving pupils of both BGS and Glenlola Collegiate, in aid of the Northern Ireland Children’s Hospice. 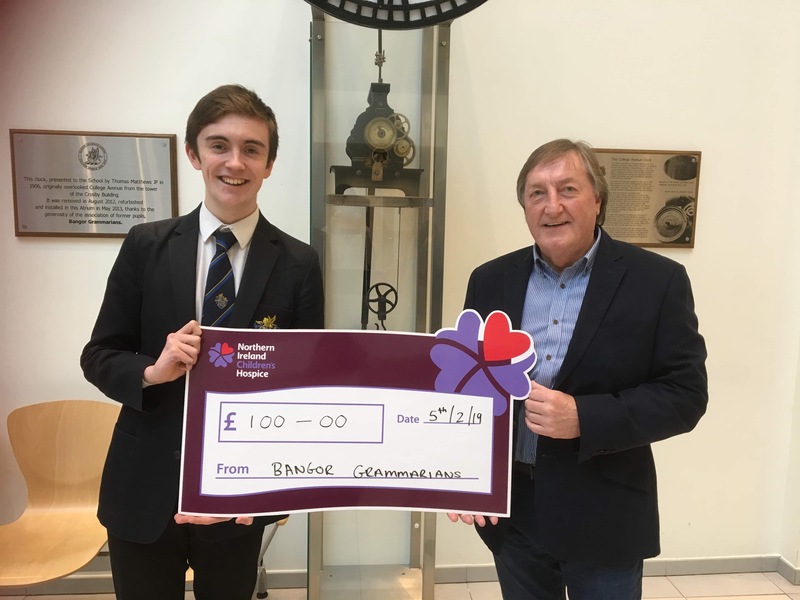 The accompanying picture shows Membership Secretary Lyn MacCallum presenting a cheque for £100 towards this very good cause to Year 14 student Tommy Bell, who will be taking part in the fundraiser at the Bangor Elim Complex on Thursday 14 February. Tommy, who has been accepted to Drama School next year, will perform a musical theatre number. Bangor Grammarians are sponsoring his appearance, while many other organisations and individuals will be supporting the remaining acts. For the benefit of those who cannot attend (see previous message for ticket details) but who would like to support the N.I. Children’s Hospice, here is the appropriate Just Giving page.